Willem Koekkoek has set before the viewer a panorama of a Dutch city in bright sunshine filled with a populace enjoying the day. The architecture is breathtaking and diverse, creating a panoply of rooftops crowned by a blue sky filled with white clouds. Charming vignettes occur throughout the scene; among others, a young boy trundles a hoop, a peddler hawks his wares, a dog is bemused by a man carrying a teapot, while another seated on his wagon converses outside a tavern. Judging by their cast shadows it is high noon. Laundry flutters from railings, shutters have been flung open, along with such detailing as the overturned basket in the left foreground, further enrich the setting. The vivid greenery of the few trees acts as a foil to the white, red, and brown of the architecture. Most notable, and the foundation of Koekkoek’s lasting fame is his skill in recreating architecture. The intricacy of the brickwork, patterning of the roof tiles, and reflections in the multipaned windows are a tour de force. Koekkoek first exhibited in 1859 in Leeuwarden. From 1869 – 1894 he continuously took part in the contemporary art exhibitions held in Amsterdam, The Hague, and Rotterdam. In 1878 he resided in The Hague and Utrecht. By 1880 Amsterdam was once more his home, until his final move in 1885 to Nieuwer-Amstel (Amstelveen). Always in search of new sights to capture his imagination, he traveled extensively throughout his beloved Holland. In 1888 he visited London, where his works were widely collected. 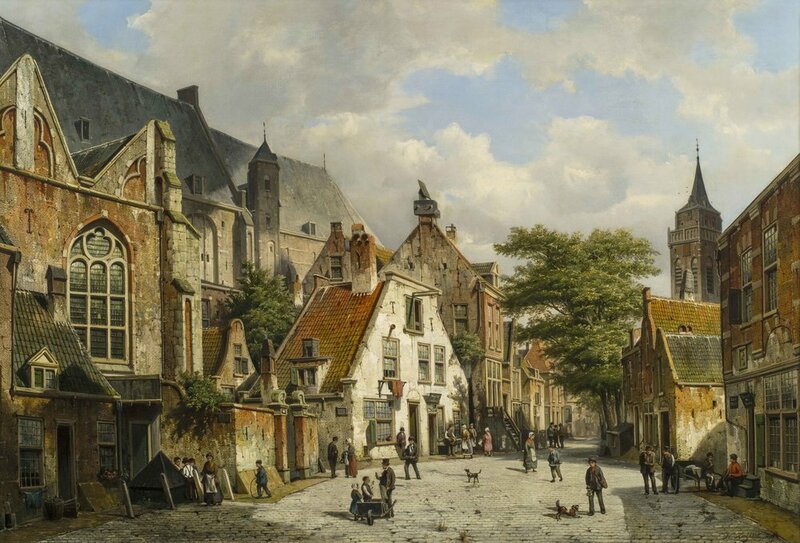 Fully in tune with the spirit of Dutch Romanticism, what Koekkoek painted was not so much a recreation of a particular place, but instead the essence of the country’s heart and soul through its buildings and inhabitants. Koekkoek’s works formed part of the permanent collections of the museums in Amsterdam; London; The Hague; Montreal; Philadelphia; and Southport, United Kingdom. Hoop trundling or rolling is a children’s game in which a hoop is rolled along, usually by an object held by the player. The goal is to keep the hoop upright for as long as possible. Geraldine Norman, ed., Marius, Dutch Painters of the 19th Century, Antique Collectors’ Club, Woodbridge, 1988, p. 293. Janet Whitmore, “Willem Koekkoek” at Rehs Galleries, Inc. at rehs.com; and “Willem Koekkoek” at rkd.nl (RKD Explore) website. Christopher Brown, “Willem Koekkoek, 1839—1895” in National Gallery Catalogues, The Dutch School 1600 – 1900, The National Gallery, London, volume 1, p. 218. Pieter A. Scheen, “Willem Koekkoek” in Lexicon Nederlandse Beeldende Kunstenaars 1750 – 1880, Uitgeverij; Pieter A. Scheen CV, ‘s-Gravenhage”, 1981, p. 278; and “Willem Koekkoek” at rkd.nl, op.cit..